4-H is the nation’s largest youth development organization focusing on leadership, citizenship, and life skills. 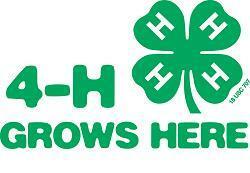 University of Illinois Extension provides 4-H programs in every county in Illinois. Illinois 4-H impacts the lives of 200,000 youth each year through sustained learning clubs and groups and short-term programming. What are the different you ways you can join? Kids can also join a 4-H SPIN Club. SPIN Clubs are special interest clubs that focus on areas, such as, gardening, robotics, shooting sports, etc. Kids first join a club that is close to where they live. The meetings last usually about one hour. Kids use parliamentary procedure to discuss different ideas, plan trips, and community service events. A snack and a game are usually provided at the meetings as well. 4-H Members are allowed to enroll in different 4-H projects ranging from Aerospace to Cooking to Wildlife. Members are given a project book which will help them learn more about the topic. Kids have a chance to show their projects at the County Fairs. Call 217-333-7672 or fill out the form here.